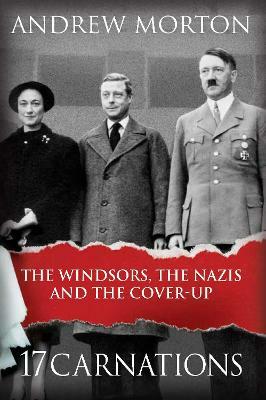 The fascinating true story of Edward Windsor and Wallis Simpson's involvement with the Nazi regime, and the post-war cover-up, told in full for the first time by bestselling author Andrew Morton. The story of the love affair between Wallis Simpson and King Edward VIII, and his abdication in order to marry the divorcee, has provoked fascination and discussion for decades. However, the full story of the couple's links with the German aristocracy and Hitler has until now remained untold. Meticulously researched, 17 Carnations chronicles this entanglement, starting with Hitler's early attempts to matchmake between Edward and a German noblewoman. While the German foreign minister sent Simpson seventeen carnations daily, each one representing a night they had spent together, she and the Duke of Windsor corresponded regularly with the German elite. Known to be pro-German sympathizers, the couple became embroiled in a conspiracy to install Edward as a puppet king after the Allies were defeated. After the war, the Duke's letters were hidden in a German castle that had fallen to American soldiers. They were then suppressed for years, as the British establishment attempted to cover up this connection between the House of Windsor and Hitler. Drawing on FBI documents, material from the German and British Royal Archives, and the personal correspondence of Churchill, Truman, Eisenhower and the Windsors themselves, 17 Carnations reveals the whole fascinating story. Steeped in intrigue and suspense, this account throws sharp new light on a dark chapter of history. Andrew Morton is one of the world's best-known biographers and a leading authority on modern celebrity as well as royalty. His ground-breaking 1992 biography revealed the secret world of Diana, Princess of Wales. Written with her full, though then secret, cooperation, the book changed the way the world looked at the British royal family. Since Diana: Her True Story, he has gone on to write Number 1 Sunday Times and New York Times bestsellers on Monica Lewinsky, Madonna, David and Victoria Beckham, Tom Cruise, Angelina Jolie, and, most recently, on the Duke and Duchess of Cambridge in William and Catherine: Their Lives, Their Wedding. The winner of numerous awards, he divides his time between London, Hollywood and Manhattan.